A new website reveals how non-recyclable (‘black bag’) waste collected from c.370,000 homes across the London boroughs of Croydon, Kingston, Merton and Sutton is safely and efficiently turned into energy for homes and businesses. 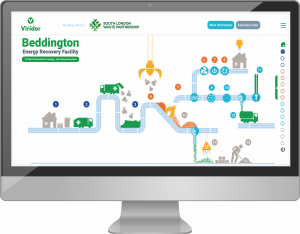 The ‘virtual visitor centre’ (www.beddingtonerf.info) takes visitors on a guided tour of the Beddington Energy Recovery Facility (ERF), which has been under construction since 2015 and is now close to completion. The website uses eye-catching graphics to guide visitors through the 15-step journey that their non-recyclable waste goes on; from being discarded in the rubbish bin to being turned into energy. The importance of reducing, reusing and recycling as much waste as possible is highlighted. Information is provided on how the ERF treats any emissions before they are released into the atmosphere via the flue stacks (chimneys). This ensures that what comes out of the flue stacks (mainly steam and Carbon Dioxide) complies with the strict Environmental Permit, which is issued and monitored by the Environment Agency to protect public health and the environment. The website provides members of the public with easy access to Emissions Monitoring Data reports, which will be uploaded twice-a-month. The site features photographs from inside the ERF; these will be supplemented with videos in the coming months. Having completed the virtual tour, visitors have the option of booking a place on a real-life tour of the facility. Regular pre-arranged tours will start in the coming months, when the on-site Education Centre opens its doors. For decades, rubbish from households in the four South London Waste Partnership boroughs has been safely landfilled at the Beddington site in Sutton. But the four boroughs wanted to find a more environmentally sustainable and cost-effective option for dealing with non-recyclable waste. Located near to the landfill site, the Beddington ERF safely treats non-recyclable waste by recovering energy at high temperatures under controlled conditions to generate energy. The facility generates c.26MW of electricity per year; enough to power around 30,000 homes. It will also provide district heating to households and businesses on the nearby New Mill Quarter development. Construction of the Beddington ERF started in 2015, with the first delivery of household waste being made to the facility in July 2018. Since then increasing amounts of waste have been diverted away from the landfill site and into the ERF. This waste has been used to operate the facility while the commissioning tests are carried out. Since November 2018, the facility has been running reliably and exporting power to the National Grid. Viridor’s construction partners remain on site finishing off the administration building (which will contain the Education Centre) and workshop.